All Summer Sundays Concerts at Rocky Point Park are free events. Our Special Event Christmas Concert with EAGLE EYES Tickets now available here at a preseason discount while they last. ‘Eagle Eyes’ are a Tribute to one of the most legendary Rock & Roll Bands of all time ‘The Eagles’. When the fans and soon to be fans witness an “Eagle Eyes” performance it is quite evident that the love and respect that the members of Eagle Eyes have for the band they pay tribute to is first and foremost and is the core reason they love to perform the vast catalogue of hits that the Eagles have produced over their Rock N Roll Hall of Fame career. 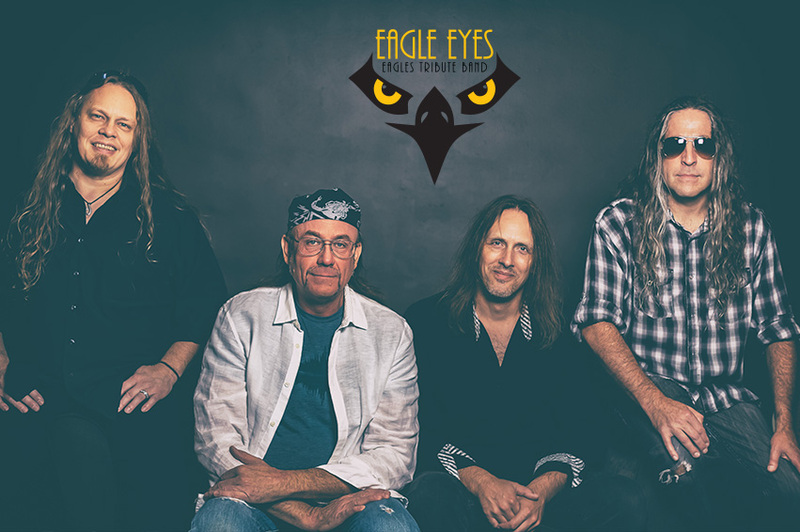 The four members of Eagle Eyes have over 120 years of combined experience as professional touring musicians honing their musical and vocal skills. Jack Gunderson/ Bass & Vocals – fills the vocal role of Glen Frey along with being one half of the tight and unified rhythm section as the bassist with Eagle Eyes. Jason Dunajski / Guitars & Vocals – fills the vocal role of Don Henley and Randy Meisner and one half of the guitar tandem along with Ray Harvey and possesses the instrumental prowess of past Eagles members Don Felder and Bernie Leadon. Greg Murray/ Drums & Vocals – being the engine of Eagle Eyes keeping the tempo of the songs flowing while adding the all important role of providing harmony vocals the staple of the distinctive Eagles sound. Ray Harvey/ Guitars & Vocals – is Eagle Eyes exacting version of infamous Joe Walsh with his dynamic lead solos and soulful slide guitar parts not to mention 1/4th of Eagle Eyes spot on vocal styling.